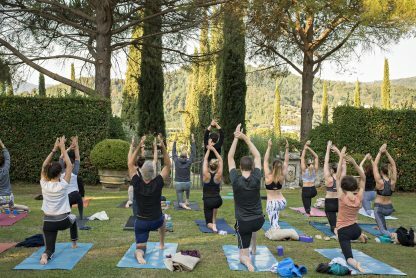 Join our popular annual yoga retreat in Tuscany, Italy where leading London teachers Emma Henry and Adam Husler will be joining forces to offer you an epic week of yoga. Two top chefs will create a delicious retreat menu and there is plenty of time to relax by the pool and enjoy our exclusive estate, hidden in the picturesque Tuscan hills. 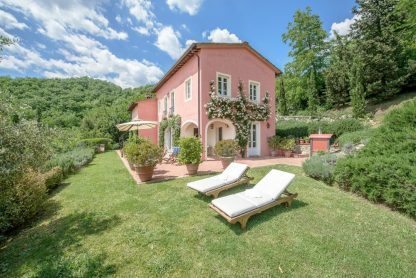 If you are looking for a sunny European retreat, our huge private Tuscan estate has it all with 4 luxury villas, 3 swimming pools, extensive gardens, olive groves and and beautiful orchards. This is a big retreat for 40 guests. There is lots of space on our estate for everyone to have a relaxing stay and we have a big team to take care of you. Our programme is carefully planned to make sure you get plenty of individual attention. (We have smaller retreats in other locations if you are seeking a more intimate experience). Emma and Adam will work closely together offering you a combination of flow classes, workshops and relaxation sessions. Each morning the group will be practice a dynamic yoga flow class on the beautiful front lawn. In the afternoons you can choose a focused workshop to explore your practice in more depth, work on anatomical alignment or turn up the volume with an advanced class. Or if you need to chill, skip the workshop and try a yin or gentle yoga class instead. Our best bodyworkers will be offering massages throughout the week and there is time to explore Tuscany further, with trips to the nearby historical city of Lucca, Florence or the Italian riviera easy to arrange from our location. Morning yoga: The whole group will practice yoga together each morning for 2 hours. Morning classes will be an invigorating flow, so be prepared to be challenged. Enjoy Emma’s distinctive, hypnotic melodic tone of voice which helps make challenging transitions easeful. Adam’s love of anatomy and creative sequencing makes his alignment based vinyasa classes the perfect compliment. On some days Emma and Adam will teach together. Afternoon yoga: In the afternoon two classes will run at the same time so you can work in smaller groups with your teachers. You can choose from a 2 hour workshop with specific focus where you can develop your practice, enhance your knowledge or take on a more advanced sequence, or take the 75 minute yin or gentle yoga practice. Emma Henry teaches Jivamukti yoga. Classes will include chanting, breath awareness, flowing vinyasa sequences, alignment exploration, hands-on assistance, relaxation and meditation. Read more about Jivamukti yoga and try a free online class here. Adam Husler’s creatively sequenced yoga classes feature long holds, controlled yet dynamic movements, intelligent alignment and deep exploration of depth in postures. Each class features a new sequence with a particular anatomical focus, so prepare to be kept on your toes and you explore mobility, flexibility and strength. Your meals will be created our chefs Bettina Campolucci Bordi and Richie Tewnion. You’ll be served a beautifully presented Italian inspired plant-based, low gluten menu. This retreat takes place during the height of growing season so our chefs are working with an abundance of fresh produce grown by local farmers and harvested daily from our estate. 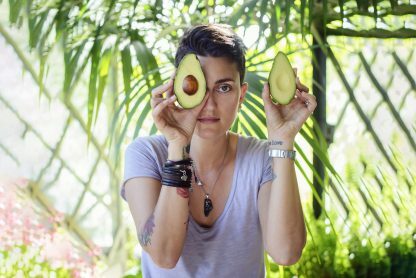 Bettina will also host a vegan cheese making class where you can learn the art of putting together a delicious cheese board with a difference! We have 4 gorgeous villas set on a huge private estate giving you a range of accommodation options to suit all budgets. There are 3 swimming pools shared between the 4 villas. The grand villa has ten bedrooms. Two of these rooms are private suites with a dressing room and ensuite bathroom, three more are private ensuite rooms and five more simple rooms share three bathrooms. 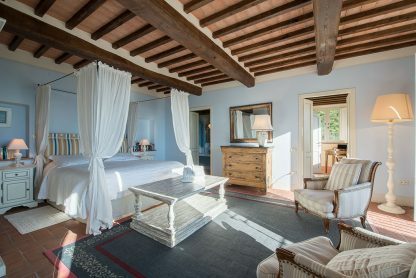 Our spacious and beautiful Tuscan villa has eight ensuite bedrooms. Our Lemon Grove villa offers the quintessential Tuscan experience in a 3 bedroom self-contained villa covered with honeysuckle, set in the orchard with its own private garden. 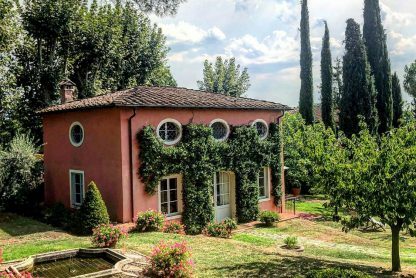 The Olive Grove villa is our most private villa, located at the top of the estate with far reaching views across the Serchio valley. It is a beautiful 3 bedroom villa with a swimming pool and secluded gardens. The master bedroom has a king size bed and French windows opening to magnificent views and there are an additional 2 double or twin rooms that share a bathroom. This villa is a little separate from the others, reached by a 10 minute walk through the estate along a pine tree lined path way. The nearest airport is Pisa and you can fly direct from UK with British Airways, Easyjet and RyanAir. Fares will be around £200. We advise that you book early to avoid higher fares. You can catch the train from Pisa Centrale to Ponte a Moriano. The journey takes around an hour and costs around 5.20 Euros one way. You’ll need to change at Lucca. You can check out trains here: www.trenitalia.com. From Ponte a Moriano the villa is less than ten minutes walk. You can join our minibus pick up which will depart Pisa airport for around 15 Euros per person one way. We will also have a return minibus departing at 10am on your final day. 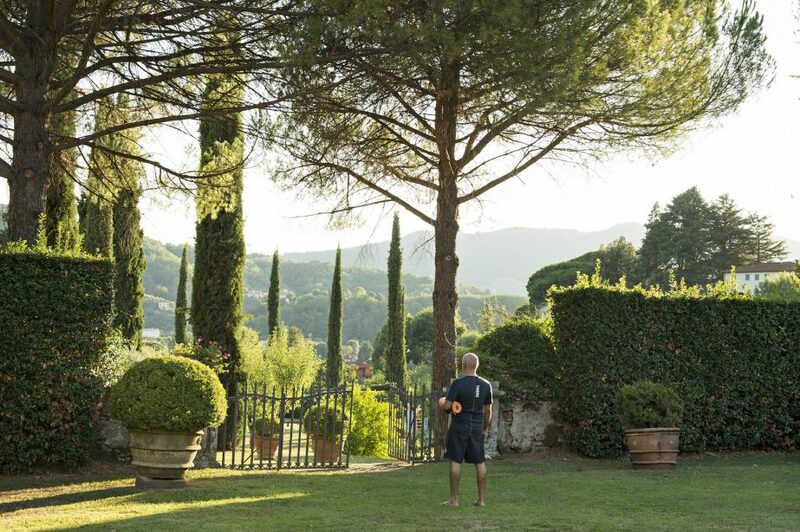 The Reclaim Yourself retreat in Tuscany was a great experience for me and my family. 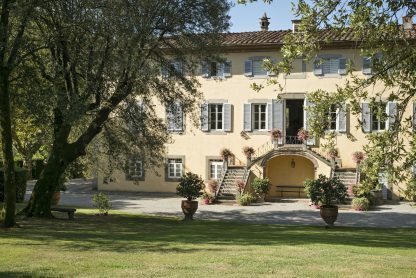 My wife, my daughter and I spent a very relaxing and joyful week at this amazingly beautiful estate in the hills near Lucca. I can recommend this retreat to anyone who wants to enjoy challenging yoga classes in a chilled out atmosphere and a friendly environment. Jools and her team do their very best to make everybody feel at home and Emmas and Adams yoga classes are perfectly adapted to the needs of their students. So everything is top-notch and professionally organized. The Reclaim Yourself team have got a recipe for retreats so good that no-one else need bother trying to run one….they have made it unbeatable in every aspect. The teaching was of the highest standard and there was something for everyone, whatever level you were. The estate was like something out of a Tuscan painting, only the lighting was better at the thing. The food was delicious and totally satisfying and the team running the show have thought of everything so you don’t have to. It is impeccably run and with a lot of heart. I cannot recommend it more highly! The minute I entered the picturesque estate of the Tuscany retreat, I never wanted to leave again. The moment I got to know the beautiful Reclaim Yourself family, I felt home. The hour I did the first yoga class with Emma and Adam surrounded by birds and trees, I wished I could stay forever. Now that I am writing this I still feel strong, energised, balanced and full of gratitude for this magical experience and the people I have met. I can highly recommend this to everyone! As soon as I got back from Reclaim Yourself’s Tuscan retreat I started recommending it to friends and family – and looking into booking my next one! I’ve never before practiced yoga in such a picturesque setting and it was truly healing and strengthening. With plums, grapes and figs ripening in the trees, warm sunshine, fantastic vegan food, experienced, knowledgable and inspiring teachers, and super organisation from Jools and the team, everything was designed to make me feel welcome and looked after. I came back stronger, calmer and better able to manage the return to everyday life. Thank you! I absolutely loved the Tuscany retreat and it exceeded all my expectations. Adam and Emma had great classes, their styles were complimentary and the classes catered to all levels. The food was delicious, nutritious and plentiful, and I appreciated the cooking classes as a fun afternoon activity. The property itself was stunning and the photos don’t do it justice. Jools and her team were fabulous hosts and made sure everyone felt welcomed and was well looked after. I highly recommend this retreat and would definitely book again with Reclaim Your Self. What an incredible experience. If you are thinking of going on a yoga retreat, turn that intention into action now! Booking with Reclaim Your Self is a decision you will not regret. 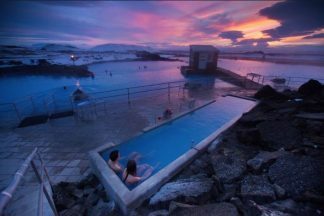 The location was everything I hoped for and more – stunningly beautiful yet healing and relaxing. The yoga teachers were both amazing, adapting their classes to ensure everyone had a great experience, challenging the advanced yogi whilst encouraging and supporting those on the start of their journey. The food was so nourishing – yet so delicious – vegan cuisine at its finest. And finally, Jools and the team were truly world class, making sure everyone on the retreat had the most wonderful experience. I could see myself do this over and over again. 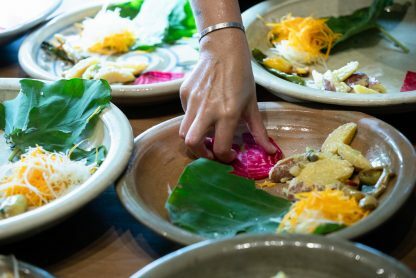 Huge shoutout to the entire team who not only go that extra mile on everything, they have crafted an idyllic experience – from the choice of setting, location, organisation, inspiring and challenging yoga practices and fab food. It’s been an all round magnificent experience and hope to be able to hold on to that vibe for as long as possible! Jools, Emma, Adam, Saba and the rest of the team are very special and the whole retreat is carefully planned to ensure you are feeling on top form by the end of the week. 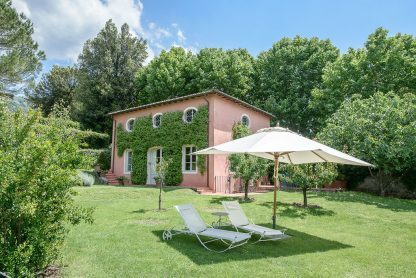 There is a good balance of challenging yoga, workshops to refine knowledge and skills, fabulous food and time for relaxation in this idyllic Tuscan estate. I highly recommend this retreat. I agree with the comments posted above. Beautifully organised; wonderful food (so rare to get that on holiday when you are vegetarian/vegan); enjoyable and accessible yoga class as mentioned and a very friendly atmosphere in a beautiful environment. It was my first retreat and I thoroughly enjoyed it. The attention to detail, teachers, food and back room staff were great. Jools and co made everyone feel welcome and looked after us all superbly. I would defiantly recommended this to anyone looking for a high end well organised retreat. I highly recommend this retreat to everyone. It has been a perfect week to recharge batteries as everything was taken in charge for you. Yoga classes with Emma were fantastic. I hope to be able to do another retreat with reclaimyourself: jools and all the team have been amazing – thank you! I have been recommending this retreat to all my friends as soon as I came back. I felt so relaxed and recharged after the retreat. Jools and the team really go the extra mile to make sure you are well looked after. Every details have been covered, from blankets for your early morning yoga on the lawn, through to hand san gel to keep you clean… the team worked so hard behind the scene to make sure you can, well… reclaim yourself on the retreat! You meet a bunch of amazing people and the food by Saba and the team is incredible, great yoga teachers, highly recommend to anyone who wants to spend some time caring for themselves! I highly, highly recommend the Reclaim Yourself retreat in Tuscany. The estate is magical with authentic architecture that is well-preserved to each detail. Each view on the estate is photogenic, and there are endless comforts. The food was healthy and delicious, the yoga classes were challenging, but accessible, and the entire Reclaim Yourself staff was exceptionally professional and kind. What an incredible experience. If you are thinking of going on a yoga retreat, turn that intention into action now! Booking with Reclaim Your Self is a decision you will not regret. The location was everything I hoped for and more – stunningly beautiful yet healing and relaxing. The yoga teachers were both amazing, adapting their classes to ensure everyone had a great experience, challenging the advanced yogi whilst encouraging and supporting those on the start of their journey. The food was so nourishing – yet so delicious – vegan cuisine at its finest. And finally, Jools and the team were truly world class, making sure everyone on the retreat had the most wonderful experience. Highly recommended.